As an integral part of the Incan diet, this Peruvian powerhouse dates back to as early as 2,500 B.C. Medium to hot with a subtle berry flavor with fruit tones. Its fruity, full-bodied flavor enhances potatoes and chicken dishes. 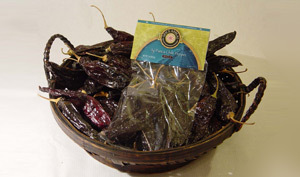 Commonly used in many South American sauces- aji molida, salsas, ceviche, pebre, ocapa and chimmichurri. The Andes’ most popular choice for making stews, sauces, and escabeche. Especially wonderful on fish. 5 Heat Rating.